The elliptical trainer offers a low-impact, cardiovascular-improving and non-weather-dependent workout. You seek out an elliptical for your home or gym workouts to improve muscle tone in your legs and protect your knees from the jarring impact of other aerobic activities. With all these benefits, you may find yourself wondering why your feet go numb when you're improving your health. A simple reason for foot numbness on an elliptical and a easy change is to wear larger shoes. You don't have to change to clown-sized waders, but speak with a shoe professional about your numb feet and increase a half a size. Your feet swell during exercise, and the larger room in your shoe prevents the numbness that occurs when your shoes are too tight. Your feet do not take all the responsibility for going numb. The elliptical keeps your foot stationary and on a flat pedal. If this is the cause for your decreased sensation, look for a different type of machine. Some ellipticals have foot pads that pivot to move your heels and toes up and down. This can reduce the chance of foot numbness. The placement of your feet on the foot pads makes a difference. Your whole foot remains in contact with the foot pads throughout the elliptical motion. If you find your weight moving forward into the balls of your feet, you may experience numbness. Slide your feet forward or backward on the pedals until you feel comfortable with blood flow returning to your toes. Keep your weight in your heels instead of forward on your toes as you push down on the pedals. 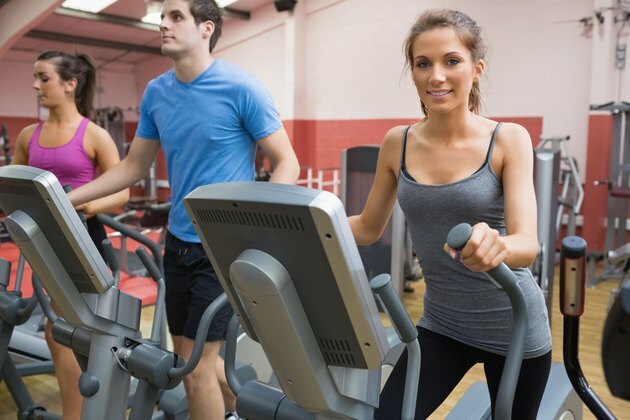 The elliptical machine keeps your feet in one position, which is the reason it is a low-impact workout. Unfortunately, this lack of movement can lead to numb toes. Another way to reduce your discomfort is to slightly lift your foot from the pedal and wiggle your toes. If lifting your foot throws off your rhythm, wiggle your toes inside your shoes to increase the circulation to the smallest of your little piggy's. What Causes Tingling in the Feet After Running?